I heard from Alanna, the woman behind Gilty Girl Cosmetics, and she wanted to know if I would be interested in trying some of her polishes, and of course I had to say yes! Alanna has had a passion for makeup for many years, and this stemmed from her mother's love of makeup. 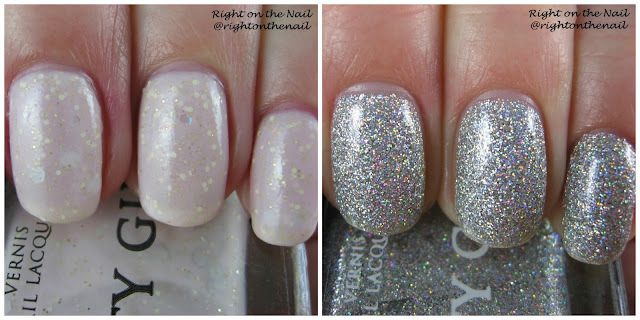 Gilty Girl has pretty much every nail polish finish you can imagine from shimmers, glitters, holos, crellies, and cremes. In total I have 4 colors to show you, and I have 2 of those to show you tonight. Follow me after the break to learn more. *special note on packaging* Many indie brands have some nice packaging, but what you can expect from Gilty Girl is definitely above and beyond. Every bottle comes in its own sturdy black box that is ready for gifting. The box is then covered in black tissue paper and has Gilty Girl ribbon placed around it with its own wax seal with a lion on it (the mascot and logo for the brand which you can also see on the website and the box). Upon opening the box you will see the nail polish which is the same bottle you can find from Butter London (same rectangular bottle that you have to remove the top cap to get to the brush...know what I'm talking about?). I found another surprise after taking the bottle out to start polishing: behind each bottle you can find an inspirational quote or a fortune you'd find in a fortune cookie. So unique! Carousel is a milky pink crelly with a sprinkling of gold and holographic glitter. It's definitely a beautiful and delicate color! I wasn't sure what to expect when it came to the formula. I'm happy to report that it wasn't chalky at all, and completely covered in 3 easy coats. It wasn't too thick or too thin, but I'd wait an extra minute or 2 between coats to inhibit any balding that could happen. Now here is the real show stopper from the brand. Supernova is their best-selling glitter polish and it's clear why. It's a straight up silver holographic glitter polish that is opaque on its own and isn't a glitter-topper. If you wanted to use it as a topper, you could probably get away with just the thinnest of coats. I used 3 coats for pictures, but I could have gotten away with 2 (pictures and bright lighting makes it look like there are bald spots that you can't see in real life). Yes, a holographic glitter polish that only needs 2 coats. I think that is something I didn't have in my collection-until now! It applied just like any normal polish, but I tried to dab the free edge of my nail where sometimes glitter wants to misbehave. You need this polish in your life. Both of these polishes retail for $13 each on their website. Find out more about Gilty Girl Cosmetics and their polishes on Instagram and Twitter.